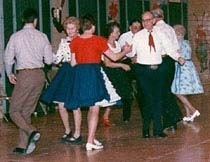 Have you ever danced a western-style square dance with a caller barking out instructions? I never have (mostly because I am absolutely certain that with my lack of rhythm I would make things dangerous for the other dancers), but I have watched it a couple of times and am always amazed that the dancers can hear the caller, understand what he’s saying, interpret what he’s saying and then actually DO it … in 4-4 time with everyone in sync. But somehow … it works. The dancers, knowing the basic calls and steps that are common regardless of the caller, sweep their feet at the same time, stride around each other in step and generally give the impression of order and effortlessness … even where the instructions/steps are difficult and the number of participants should lead to chaos. It must be exciting and fun to be able to share something so active and nimble with others who are enjoying it as much as you. Now, for the sake of this conversation, imagine with me a square-dancing scene starting out like any other. The fun and excitement mounts and the dancers begin to whoop and holler as they become more in harmony with each other, the music and the call. But just as things really get into full swing the caller begins ad-libbing, changing speeds and giving contradictory instructions. The dancers begin to get confused. They continue as best they’re able for a few moments, maintaining the dance in spite of the caller’s caustic warbles, but eventually dancers begin to bump into each other or stop entirely in disgust. There may be a few who carry on even after most of the dancers stop, but they only serve to contribute further to the chaos and indecision of everyone else. Before long, everything grinds to a halt and the dancers all look at each other with mixed expressions of antipathy and bewilderment. Still, the caller goes on bellowing incessantly into the microphone, expecting the dancers to continue perfectly. In his mind the destruction of the dance is a symptom of stupidity and revolt amongst the dancers, it has nothing to do with his rapid, ambiguous and unpredictable commands. I would bet that under those circumstances, either the caller would be hurried (or harried – more appropriately) off the stage or everyone would walk off of the dance floor and head home. 1. If the caller sticks to the basic calls, the dancers do the rest. If the government sticks to the basic laws, regulations and customs which are in place only for moral and just reasons, the economic participants move about with a minimum of miscues and errors. 2. If the caller is predictable, the dancers dance better. If the government is predictable instead of arbitrary and capricious, the economic participants are more inclined to take risks in order to better themselves – which then corresponds to economic growth across the board. 3. If the caller rapidly changes instructions, the dancers struggle to keep up or end up stopping completely. If the government rapidly changes the rules/laws/regulations, the economic participants drop into stasis, unable to move for fear that they will waste money due to another sudden change in rules. 4. If the caller’s calls are misinterpreted or not heard, the dancers become out of sync with each other. If the government attempts to communicate or enforce anything more than the simplistic and self-evident rules of nature, misinterpretations and lack of awareness will result in a grinding halt of economic activity and/or an increase in negative externalities. 5. When the dance degrades into chaos, the dancers that are still moving only add to that chaos. When the economy falters, the economy falters. In other words, if a private economic participant received special benefits from the government in order to gain their support for a government policy or in order to maintain a government-approved activity, the breakdown of the rest of the economy will mean destruction of all of the economy – including the favored institution. 6. When the dance breaks down, the dancers leave. When the economy breaks down, those who are able to leave, do so. The richest, most capable or the most daring people all pack up what they have left and move to a place where the economy is more positive and inviting. It means that businesses from Detroit move to Dallas and doctors from Los Angeles move to Singapore. It means a gain for the more free economy and a further loss for the restrictive, erratic and halting economy. 7. When the dance breaks down, it is always the dancers who are blamed even when the caller has been unpredictable and unclear. Why? Because the caller has the microphone. When the economy shuts down, it is always the business people who are blamed even when the government policies, regulations, organization or caprice is to blame. Why? Because the government has the power and wants to keep the power. 8. When the dance breaks down, the caller is to blame. When the economy breaks down, the government is to blame. Want proof? When there are missteps by a dancer, the dancer adjusts him/herself to catch back up with the rest of the dancers and is often able to do so because the steps are known and predictable. Sometimes no-one notices when they stumble, sometimes they do … but in due course, when the dance continues the dancers who are not as rhythmic or capable get pushed to the outskirts of the dance floor or move(d) to a more hospitable dance floor elsewhere (after all, are not some people meant to break dance while others meant to waltz?). When an economic participant stumbles, if the government regulations are less stringent (once again, only covering issues of justice in the economy) the participant has a chance to check his stumble, adjust to the continuing rhythm of the dance and fall back into step with the rest of the participants. But if the government’s laws and regulations – or even rules and intentions – are constantly changing in rapid, unpredictable and unclear ways, the participant is more likely to fall completely behind the rest of the economy. 9. When the dance breaks down, even though it is the caller’s fault, the caller may not see it that way and blame the dancers. When the economy breaks down, the government (particularly individuals directly responsible within a representative government – like Frank and Dodd with the Great Recession) blames the economic participants (businesses or individuals) by calling them either stupid or radical. In truth, no single economic participant – nor even a group of participants – could possibly have the power or influence to drag down the entire economy. Only the long, overreaching arm of the government has that kind of sway over something so incontrovertibly vast. Oh, and by the way, if a single participant (or group of participants) DO end up dragging the entire economy down, it is only because they have been empowered by the government with influence undue them. 10. When the dance breaks down, it is more in the dancers’ best interest to fix the causal problem than it is to the caller – they are the people there to have fun, they are the people with a vested interest in the dance going smoothly. When the economy breaks down, it is more in the economic participants’ best interest to fix the problem than it is the government’s. The government, if it is moral, will want a good economy of course. But the government does not have as much of a vested interest in the health of the economy as do the economic participants. The participants NEED the economy to do well because that puts food on the table and clothes on their backs. The government WANTS the economy to do well because it is good for the poll numbers, but the government can get what it DESIRES without the economy improving. The government is a primitive beast that is incessantly self-serving and continually ravenous for more power because it takes the selfish desires of the individual bureaucrat and magnifies them through the removal of inhibition while providing that same busy-body with what they view as moral imperative empowered by title. Throwing cash (through taxes, government bonds or inflation) into the gaping maw of an uninhibited government is the equivalent of removing growth potential from the economy – even at a dollar for dollar level. Worse still is the realization that the government, with each dollar fed into it, gets bigger, more voracious and more capricious to the point where it begins feeding directly off of the chaos and destruction that it creates in the economy to begin with. The end result is that the “caller” (government) continues sending out poor instruction because it furthers the caller’s agenda. These ten analogous examples are moderately easy to grasp and fairly authoritative simply by themselves. But when combined with the natural inclinations of man (e.g. to better his own plight, to work for his own gain, to be de-incentivized by each layer of bureaucracy and regulation to which they are obliged, to consciously weigh costs and benefits directly to himself, and to act in a semi-logical manner), these examples become veritable law. It is not necessarily – as detractors say – due to a constantly desirous selfish, ‘if I win you must lose’ attitude in man that must be policed and reined in by the ‘civilizing’ power of government. Instead, it is a powerful proclivity to better a man’s plight which leads him to act in his own benefit – whether free to choose/act or even when fettered by a hyper-regulating state. And it is the whole of trillions of free (free as in “freedom” not as in “without cost”), individual choices being made individually for individual gain every day which leads to the improvement of the economy as a whole. While there can be many examples proffered which show that an economic gain for one man is/must be a necessary loss for another, the last few hundred years of western free enterprise shows that win-win situations are not only possible but actually the rule and not the exception. Furthermore, the positive economic externalities of win-win agreements are impossible to fully quantify. Because of this, the more you regulate an individual the less incentivized he is to improve his plight and the less likely the economy and community receives the correlating positive externalities. To say it another way, the number of potential win-win transactions and therefore the number of possible positive spillover decreases as the amount of regulation increases. Here are a couple of provisos before I conclude. The analogy is not perfect even though it is extremely fitting. Firstly, I might be assigning too much influence to the caller/government. The government (any government) is deeply flawed and often serves to negate itself through its own inefficiency. However, to look past its terribly degrading effects on the economy by stating that it likely cannot afford the change that it intends due to its laborious movements is the equivalent of disregarding a stalking jaguar while walking through the Amazon simply due to the fact that very few people in the world are killed by jaguars each year. The fact is that the government (any government) is a necessary evil, essential for maintaining law and order, but as duplicitous and wicked as an underfed and mistreated guard dog. The moment the citizenry allows the government off of its leash is the moment it turns and tears its master to pieces. Second, while I believe wholly in the list of the natural inclinations of man I made above from an economic standpoint, I believe just as much (actually more) in the power of God to subvert these natural inclinations to the power of His will and to His glory. In other words, I believe that God has placed a natural inclination within man to better his position in the hopes that the sin in which we are tangled may not completely lead us to squalor, but I also believe that the man who has given his life, his soul, his whole self to God will be rational/logical in a completely foreign, but still consistent, way in this mortal coil. This spiritual man might, for instance, give his last piece of bread to a neighbor – even though it would likely lead to his own death. This spiritual man might, for instance, allow another to be rewarded for the work that he had done. This spiritual man might, for instance, take responsibility for something he did not do in order to save another person from a punishment they deserved. None of these actions make sense to the purely physical being, but to the spiritual man it is perfectly rational, abundantly reasonable and completely consistent with the natural inclination of man to want to better his state. This is incredibly important when one thinks about the arguments made by the person who argues for greater governmental interference in the economic and personal realms. When they argue that the natural ‘selfishness’ of man be curbed, sated and/or destroyed by an all-powerful state, they are making that argument from a perspective that says that man is the beginning and end of all things. To believe that man can somehow be completely incapable of making unselfish individual choices but simultaneously capable of an enlightened rule of another through some magical fairy dust that gets sprinkled on a person who works in government is not just hypocritical, but unreasonable and inane. On the other hand, if one holds the spiritual view that all people are fallen, sinful beings who are in need of God’s righteousness to make them capable of anything beautiful or praiseworthy, the natural extension is to believe that government is only a necessary evil on this mortal plain, useful only when minimally involved in people’s lives by upholding justice. With the corollary being that the responsibility for moral, unselfish behavior rests on the individual citizen who will, on one final, definitive day, answer to the highest court for his/her actions. A final thought before I finish. If God has set us free from the yoke of the old law, simply for the sake of freedom itself (Gal 5:1), why would those of us who believe in God’s saving power, His divine justice and His infinite love think that any form of slavery – whether it be to a slave-master, landowner, prince, king, emperor, commissar or bureaucrat – should be the natural state of man … economically, politically or spiritually? When talking about freedom – at any level – it is a conversation of the utmost moral significance. Therefore we should care about freedom because God cares about freedom and we should stand for freedom simply for freedom’s sake.